Espelkamp-based HARTING Technology Group (district of Minden-Lübbecke) once again achieved double-digit growth during the 2017/18 financial year (30 September). Notching up an increase of 13.4%, the globally active family-owned company achieved sales of € 762 million (previous year: € 672 million), setting yet another record for its 73-year corporate history. The jump clearly exceeded the Management Board's forecast of five to six percent at last year's annual press conference in December 2017. The HARTING Executive Board is very satisfied with the past financial year 2017/18: Andreas Conrad, Dr. Michael Pütz, Margrit Harting, Dr. Frank Brode, Philip Harting, Maresa Harting-Hertz and Dietmar Harting (from left to right). “This is a top-notch performance that makes us proud. We’re very satisfied with the development of our business," said Board Chairman Philip Harting. With the renewed jump in sales, HARTING has taken another big step towards becoming a global company. Growth came from all regions and all markets, and the company has now more than doubled its sales in ten years: sales amounted to € 345 million during fiscal 2007/08. "Our global network of development, production and sales companies means we’re in an excellent position. Our customers know that they can count on the proven HARTING quality of our products, connectivity solutions and services. HARTING is a trailblazer and partner of Industry 4.0.” Harting further emphasised the point, stating "Wherever automation, digitisation and networking machines to the Cloud are involved, our products and solutions are among the world's best in the industry." Harting noted that growth had been driven particularly by momentum from the market segments transportation, mechanical engineering, automation and robotics. 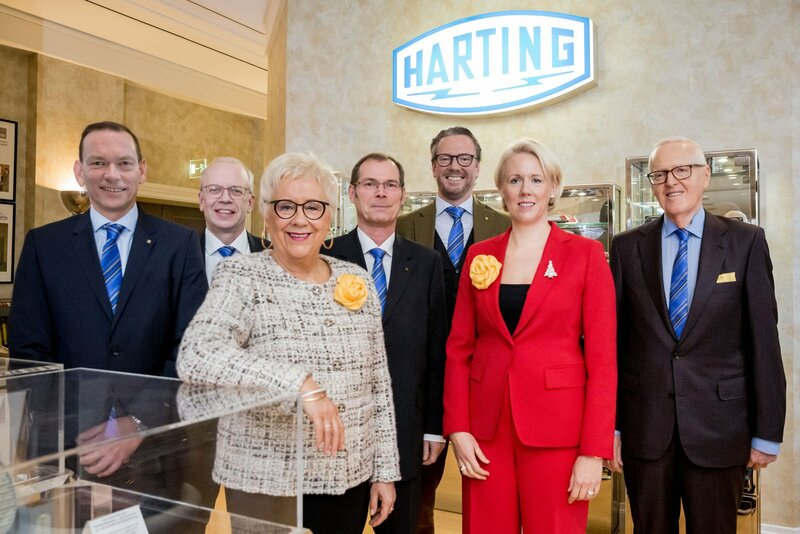 All the regions in which HARTING is active contributed to the positive result. The strongest gain was in the Asia region, which increased 18% to € 187 million (previous year: € 158 million). In Europe (excluding Germany) and the Middle East, or “EMEA”, sales increased by 17% to € 263 million (previous year: € 225 million). In the Americas region, the Technology Group recorded an increase of 8% to € 79 million (previous year: € 73 million). Business in Germany also continued to develop positively. Here, HARTING recorded an increase of 8% to € 233 million. (Previous year: € 216 million). "We once again were able to achieve a bit more at the already high level in Germany, which is an encouraging performance," Harting said. The technology group now generates some 70% (69.4%, previous year: 67.8%) of its total sales abroad. HARTING offers targeted products and solutions which meet the demands of customers and industries, as underscored impressively by the company’s latest standardisation successes. These saw HARTING successfully establish a new norm for miniaturised Ethernet interfaces on the market with its ix Industrial and IEC 61076-3-124. “HARTING is leading the industry and setting global standards," said Philip Harting. "Customers expect market-conforming standards. A standalone solution won’t help them in the long term." HARTING took another big step towards standardising Single Pair Ethernet with IEC 61076-3-125. All relevant standardisation committees have now decided to go with the HARTING design for an SPE mating face. Thanks to its very active and successful standardisation work, when it comes to Single Pair Ethernet HARTING is also setting benchmarks and creating the conditions for easier, IP-based Ethernet connection all the way down to individual sensors. The advantages for the user: space and weight savings while eliminating hitherto necessary gateways. HARTING will continue to press ahead with digitisation, as Board Chairman Philip Harting made clear. Individual subsidiaries of the technology group also benefit from the innovative digitisation solutions and the HARTING brand. For example, HARTING Applied Technologies fabricated a production system used to produce BERNSTEIN safety switches that was handed over in August at the BERNSTEIN production site in Hille-Hartum. HARTING Applied Technologies is a recognised specialist in custom machine manufacturing, as underscored by the renewed "Excellence in Production" award in November. Applied Technologies won the award for the third time in a row. "With our expertise in the area of connectivity, infrastructure and mechanical engineering, we help other medium-sized companies in the region Ostwestfalen-Lippe to become even more efficient and productive," Harting emphasised. HARTING Systems, a specialist in sales systems and vending machines in the retail sector (retail stores and petrol stations), also benefits from digitisation and know-how within the technology group. At the "EuroCIS" trade fair in February, HARTING Systems presented innovative, digital solutions used in products sales. The Board chairman sees great opportunities in the field of electromobility. HARTING has now created an automatic charging solution in conjunction with partners Rinspeed and KUKA. The charging assistant - a gripper robot from KUKA - optimally guides the DC Combo 2 connector into the charging socket on the vehicle. Following charging, the robot removes the connector and cable, with the vehicle once again ready for use again after a short period of time. The provision of the powerful DC power supply is optimally adapted to the charging assistant. Subsidiary HARTING Automotive has grown strongly in recent years and is investing in the expansion of its production capacities in Sibiu and Agnita (Romania). The company has long been at home on the automotive supply industry market and has recently seen a sharp increase in demand for e-mobility solutions. The company uses its decades of experience in the field of connection and transmission technology to develop and produce charging equipment for electric and plug-in hybrid vehicles. Fast-charging technology is a compelling example of growing market demand and is leading to a steady expansion of the portfolio of products and components. "We invested a total of some € 63 million during the past financial year,” said Management Board member Maresa Harting-Hertz at the annual press conference. A large part of this flowed into the European Distribution Center (EDC) in Espelkamp. Investments were also made in new product development at the HARTING Development Center (HDC) in Rahden. The HDC bundles development expertise with a focus on Industry 4.0. "As a result, we’ve strengthened our locations in Espelkamp and Rahden," Harting-Hertz noted. Last but not least, HARTING is further expanding its global production network, thus creating the conditions for further growth and more flexible and high-performance production. "Consequently, digital and automated production was expanded in Espelkamp during the past financial year," says Board member Andreas Conrad. The renewed double-digit sales growth and investments targeted towards securing the Group’s future had a positive effect on personnel development, explained Board member Michael Pütz. The number of employees (including trainees) increased to 4,980 during the course of the 2017/18 financial year (previous year: 4,639), an increase of 7.4%. Some 77 new jobs were created in Germany (3.1%), while 264 employees were active at foreign production sites and subsidiaries (12.3%). At the German locations (Espelkamp, Rahden, Minden), a total of 2,577 employees were active as at 30 September 2018, with 2,403 working abroad. Education and training have been a high priority at the Technology Group for decades. At present, 150 commercial and technical-industrial apprentices as well as dual-study students in 22 professions are being prepared for their future work. The new HARTING training center (NAZHA), which opened in 2008 and was expanded in 2015, celebrated a small anniversary in the middle of the year. More than 400 young people were trained over NAZHA’s first decade, and all passed their final exams. The importance of the Technology Group for the region was highlighted by Board member Margrit Harting. She also cited awards for quality, products and sustainability, as well as the local and regional commitment of the Group. "We have to face competitive challenges on a daily basis. Nevertheless, we know what our roots are, and have an obligation to social commitment," Harting emphasised. Traditionally, HARTING is involved in the areas of culture, sports, education and youth, and supports and promotes associations, initiatives, projects and events. A special highlight last year was the commitment to charity Deutsche Sporthilfe. Two charity matches between TuS-N-Lübbecke and GWD Minden and a selection of Mühlenkreis against a DHB Allstar team - among others featuring discus world champion and Olympic champion Robert Harting - raised 51,000 euros for Deutsche Sporthilfe to promote handball projects. HARTING will continue to demand digitisation and the technological transformation of the company over the next few years. Everything that can be networked will be networked. "In order to remain competitive in the industry over the long term and to grow in the years to come, we need to digitise all the processes that are necessary," said the Board chairman. He sees federal and state government as carrying an obligation to invest in digital infrastructure (keywords: broadband build-out and 5G). Board chairman Harting sees the technology group as being well positioned, nevertheless it still needs to closely observe the markets and economic developments with precision. "We’ve got the risks and challenges in view", he said, citing "trade wars", punitive tariffs as well as Brexit. "The economy deteriorated in the fourth quarter of our fiscal year," he added. Weakness had continued in some HARTING business areas, with the development uniform in nature. As a result, growth rates in the first few months of the new 2018/19 financial year were weaker. "The zenith of growth has passed," Harting explained. Consequently, the technology group expected only an increase in sales of just under five percent for the current 2018/19 financial year. Industry group the Association of Electrical Engineering and Electronics Industry (ZVEI) expects an increase of four percent on the world market for the coming calendar year.